I am standing at the end of the road of my knowledge. I am trying to setup a raspi 3b+ with Ubuntu Server 18.04 arm64. I downloaded the arm64 iso from http://cdimage.ubuntu.com/ubuntu/releas ... -arm64.iso and followed the instructions on https://wiki.ubuntu.com/ARM/RaspberryPi ... ISO_images. But I do not have success to get Ubuntu Server to run. What do I have to do to achieve a successful installation? Hi, I'm sorry those instructions didn't work for you. Could you provide more details about what is the problem you are having? The main problem is that the pi does not boot into ubuntu server. And I am not sure which files exactly have to be copied to the boot partition of the sd card. I've never installed from the server ISO. I'll download it later and have a play. When you say it doesn't boot into Ubuntu server, do you mean you can't get the installed system to run, or do you mean you can't get the installer to run? I wrote the instructions you are following so it would really help if you could be a bit more descriptive in what you've done and what you are seeing on the screen. I've just run the server installer. I hit two problems. The first is uboot doesn't like my USB drive so it stalls at uboot. Using an Sd card gets over that. The second is when the installer scans for the cdrom it doesn't find it because it is on an sd card. Inserting the USB drive back in at this points overcomes that. I have a 3B. You'll face more obstacles with a 3B+. I'm having issues with the instructions of getting the installer to boot off SD card after following what instructions I can. As my main computer is a Windows PC I understand I'm missing a great deal of tools to do some tasks like compile the u-boot image but I don't have a system I'm prepped to install linux on other than a RPI. I'm just not sure of our the SD partitions should look when I go to insert it into the PI as the instructions expect me to have another linux computer to use to setup the SD card. Is there a particular reason why you need a 64bit operating system? Ubuntu provides an official 32bit version that is installed just like raspbian. If you want to have a go at the server instructions then you can do it all from a live/desktop Ubuntu ISO running on your PC. Or you can set it up from raspbian/32 bit Ubuntu etc running on the pi. Are you even able to download additional software when running from live CD? As I would need to be able to get a cross compiler among other things I would likely need to do it via a USB boot on my main desktop. Haven't done much with the live desktop option in a while. Are you even able to download additional software when running from live CD? I got it to boot manually, but I'm having trouble with configuring grub. maybe those steps here help in some way or another. but as I said it's broke. On pi3b+, booting from USB, I am able to run Ubuntu server iso arm64 and make arm64 installation. I pre format my target usb as msdos part 1 fat32 and part 2 ext4. grub install fails near the end (as seems to be expected) but everything else seems to complete ok.
After install part 1 is still empty and part 2 contains what appears to be good filesystem. fstab looks good with mounts for / and /boot/firmware by UUID. However per the other previous post I cannot set this up to boot from the fat32 part1.. I have tried a very large number of creative ideas for the part 1 fat32 including every post I have found on the subject many of which are divergent or contradictory. config.txt, cmdline.txt, cloning images from /boot into the fat32 partition 1, compiled uboots etc. The wiki.ubuntu.com page is helpful but also confusing as it covers in the same document merged instructions for many diferent dated ubuntus, many different dated pis and many different arch and builds so it is difficult to know what is the magic combination for bionic/usb/pi3b+. I believe that the kit and setup is good and and along the way I have been able to see it setup the new lan ok, request dhcp, receive and set the correct ip, try and retry to boot from tftp but I do not want to boot from the net. I need a stand-alone usb bootable configuration - My knowledge of grub is not especially good. Is there a "known to work" step by step for Ubuntu server 18.04.1 to allow boot (pi3b+/usb/arm64) of an installed system from part 2? The wiki includes an example of how to boot the system using the installers grub. I don't have a 3b+ so somebody with one will have to edit the wiki with any particular instructions for that. The following script should create an installer using the linux-raspi2 kernel. This should work on the 3b+ (ethernet and wifi working). I wrote it a while ago, not sure if I fully tested it. It has a massively long wait at the rainbow screen due to a huge initramfs. # Construct a arm64+raspi2 installer. #   !This is not automatically updated by the flash-kernel pacakge! # Ignore "no kernel modules were found for this kernel"
logger -t late_command "Removing update-initramfs diversion"
logger -t late_command "Installing raspi2 kernel"
logger -t late_command "Removing generic kernel"
old_kernel="$(readlink /target/boot/vmlinuz.old | sed 's,^vmlinuz-,,g')"
logger -t success_command "Copying wifi firmware"
# !Users will have to manually update! chroot /target dpkg-divert --divert "/lib/firmware/brcm/$(basename "$i").bak" --rename "/lib/firmware/brcm/$(basename "$i")"
logger -t late_command "Removing cups-filters.conf"
logger -t late_command "Copying bootloader files"
logger -t late_command "Running flash-kernel ..."
logger -t late_command "error: apt-install flash-kernel u-boot-tools failed"
logger -t late_command "error: unknown model"
# Run out of space on boot partition or missing dtb file? logger -t late_command "error: flash-kernel failed"
logger -t late_command "flash-kernel successful"
version="$(ls /tmp/pi-kernel/boot/vmlinuz* | sed 's,^\/tmp\/pi-kernel\/boot\/vmlinuz-,,g')"
echo "Copy all files (including the hidden .disk folder) in the server-raspi2 folder to a fat formatted usb drive." I have not found the examples for booting from that wiki actually work with the ISO-install/18.04.1/arm64/pi3b+ combination. Unfortunately the rest of the reply relates to raspi2 which is armhf. and I am trying to boot an arm64 installation. There are arm64 and armhf raspi2 kernels. "fb: switching to vc44drmfb from EFI VGA"
with occasional plausible disk (usb) activity. then why not share, so we can feed back progress? From my experience, I got this error "grub-install: error: cannot find EFI directory". To make it bootable without installer media, you have to copy start*.elf, fixup*.dat, bootcode.bin, *.dtb and kernel8,img from install media to your boot partition. I was able to get rid of the grub install EFI error thanks to your post but I can't boot to ubuntu using my boot partition (with raspberry firmware/bootloader & u-boot files on it). I have abandoned the idea of putting Ubuntu 64bit directly on Raspberry pi, so I don't have those files on any of my SD card now. Since your install media can boot into u-boot without any problem, if you copy all necessary files from install media to the boot partition of your SD card, it should work. Make sure your SD card is partition with MBR, not GPT. When you do "ls" command under u-boot, partitions should be listed like (hd1,msdos2), "msdos*" means it is MBR disk. There is another way to run 64bit applications on Raspberry Pi. 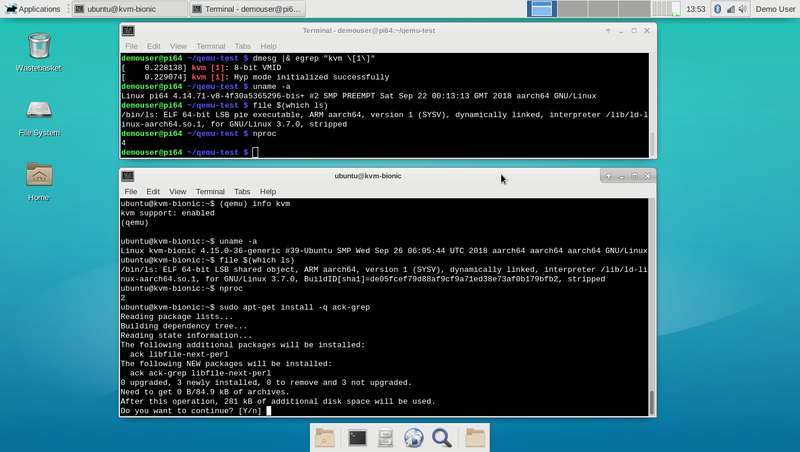 Compile your own 64bit raspbian kernel. Keep userland 32bit. In this way, you don't have to deal with any driver incompatibility issue. 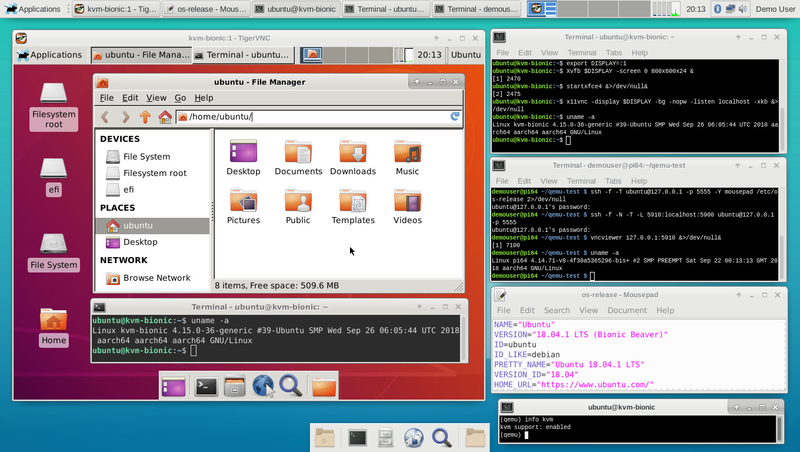 Then, you can "chroot" a full 64bit debian/ubuntu distro. You can find lots of tutorials regarding how to cross-compile 64bit raspberrypi kernel.